Python (multi-platform programming language) officially dropped its support for Windows XP. Python programs are slightly different compared to other programs, because they are not compiled when you download them: they are just scripts. When you click on them, they will look for Python "assemblies" in order to quickly compile the program during the runtime. (It's not 100% true, but that's an over-simplyfied explanation). So... since Python dropped its support for XP, this meant a big issue for Python programs 'cause the old "assemblies" can't compile 3.5 scripts; that's why Python 3.5 Runtime Redistributable - Windows XP is here for you. Please note that this is an unofficial Runtime Redistributable package. Extract it to "C" and rename it "Python35". The core and its dependencies have been compiled to run in Windows XP, but I have been able to test with a single program 'cause I don't have any other programs written for Python 3.5. You'll find the official Python website screen and the backported version below. Sadly I only used Py2.7, so can't help here. @Mcinwwl... yep. Anyway, I tested it with a program and it works. Dunno whether some functions won't work, though. Actually, it was working on my computer in 2015 and it still is now. It must be something about your configuration. Anyway, years passed and nowadays Python 3.7.1 is out. Programmes written using 3.7.1 capabilities won't be able to be compiled at runtime by Python 3.5 anyway, so even if you manage to get it up and running, it would be useless for programmes written after 2016. Someone should backport a newer version of Python. @someguy25 I noticed that you opened a topic already about newer version of Python, but as @Dibya said, there's no guarantee that it will be working. As i know MSFN is a magical place. I tried downloading & installing and got the same result. It's hard to tell from the screen shots, but it looks like @FranceBB's installation contains eight folders in addition to the seven files that were created during installation. My guess is that some/all of those folders and their contents are also required, but I don't know where one would get them. Edit: Got it working. 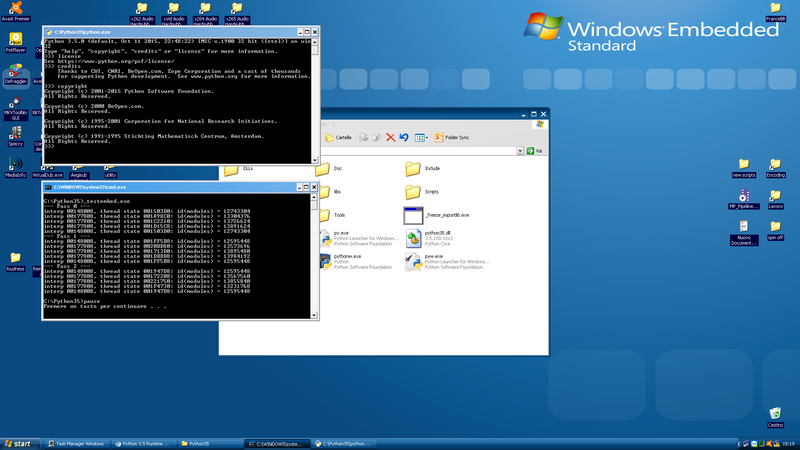 Had to install Python 3.5.4 on a Win 7 system, then copy all the folders over, but it works now. @someguy25 I'm not really sure about what I did in 2015/2016, but I tried make a new installer and it found 3481 dependencies and I have now included them all. Is that the old project you're alluding to? Hey dude , I got a snake from jungle ported for you . Take care of my pet python. It looks like it doesn’t find _socket.pyd. Any ideas how to fix this problem? I think it sorely needs pip. Also, there are some registry settings associated with python. I will do some tinkering on these. You're right! Just when trying to install pip, the above error occurs.